Sure, it may not make a lot of sense for most of your first viewing, and some people might argue that it still doesn't make sense on subsequent viewings, but that's part of Phantasm's charm. It's not supposed to unfold like a textbook on logical entailment. "Phantasm," the word, means "an apparition or specter, a creation of the imagination or fancy, an illusory likeness of something" and that's just what Phantasm, the movie, offers--a surreal, multifaceted trip through a fantastic, horrific, slightly sci-fi world with just a touch of black comedy. Phantasm is truly a child of Don Coscarelli, who served as producer, writer, director, cinematographer, editor and probably fetched coffee for the actors. Most of the rest of the crew consisted of Coscarelli's friends or relatives, such as his mother, who was responsible for production and costume design as well as make-up. Obviously Phantasm was a low budget affair, but whereas that fact can sink many films, the close-knit atmosphere that it necessitated in Phantasm enabled the film to retain focus while forcing creative effects and clever performances that never come across cheaply. On the surface, the story is about two brothers, 13-year old Michael (Mike Baldwin) and his older brother Jodi (Bill Thornbury), and one of Jodi's best friends and bandmates, Reggie (Reggie Bannister). Michael and Jodi have lost their parents, and as Phantasm begins, another friend, Tommy, is killed. That brings our heroes to the Morningside funeral home/cemetary and its bizarre caretaker, "The Tall Man" (Angus Scrimm). Most of the film consists of our heroes investigating Morningside in their somewhat reckless manner and discovering that odder things are going on there than they ever dreamed of. Coscarelli has stated that Phantasm is primarily about the rituals that surround death in America. That, along with literal depictions of the various senses of the word "Phantasm," is really a better description than the ostensible plot I outlined above. That makes Phantasm unfold more like a poem than a novel, and creates some of the impression that the film seems to make little sense, as we expect films to be more like novels. It certainly doesn't make Phantasm any less of a film--just different, and it may take at least two viewings to read it properly. In addition to Coscarelli's purity of vision, Phantasm benefits from a fabulous score that rivals Halloween's for importance to the film, amazing mortuary sets that are responsible for much of the film's otherworldliness, great choices for location shots/exteriors--especially the mansion that was used for the outside of the funeral home, and terrific performances from a cast who remains largely unsung outside of the Phantasm series. 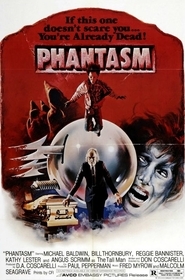 Phantasm is also an important film historically, as it sparked a trend towards surrealness in many horror films from the 80's, such as the Nightmare on Elm Street films. The film also set a standard for special effects that are integral to the plot but never overtake the film--such as the incredible, infamous, silver sphere. Phantasm may not be the most important film in the genre, but for this reviewer, it had more of an impact on me and attracted me to genre when I first saw it in the theater as a 12 year old than any other film. 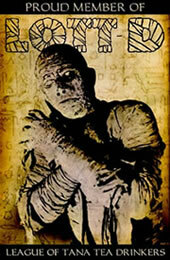 Before Phantasm, I watched the occasional horror film. After Phantasm, I tried to see everything. Note on the DVD: I was lucky enough to pick up Phantasm on DVD for about $13. The DVD is an absolute must. The print is beautiful in the original widescreen ratio and with deep blacks that merge with the top and bottom of your screen. The DVD is loaded with extras--10 minutes of cut scenes, a commentary track featuring Coscarelli, Baldwin, Scrimm and Thornbury, a "home movie" behind-the-scenes feature narrated by Coscarelli and Bannister, an informative 30 minute interview with Coscarelli and Scrimm from 1979, trailers, a remastered, digital stereo soundtrack as well as the original mono track, stills of lobby cards and pressbooks, an audio recording of a disco 12-inch of the theme, an audio recording of Thornbury's song that is featured in the film, etc. They did an excellent, exemplary job with the disc.